I have no self-control. I’m supposed to be Searching for the New but I’ve resorted to my old ways, reveling in the poems of my personal canon of poets. I like the idea of a personal canon of books, especially when a large section of the more known literary canon (read here as the Western canon), while good books, don’t speak to me nor of my experiences; that canon doesn’t echo my world. Lucille Clifton’s poems are canon. 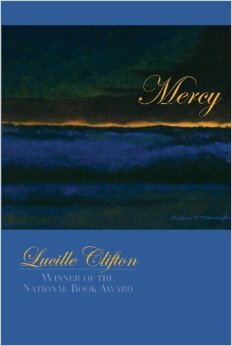 Today’s #NationalPoetryMonth poem is Clifton’s “here rest” from her collection titled Mercy. An exquisite poem–the certainty of a Josephine’s “when you poem this/and you will”, the blessing in the last stanza; enjoy! “Another poem is about my sister — I had a sister who was a prostitute. And she was wonderful, and look, I wasn’t the only sister who has a sister who was a prostitute, I am the one who talks about it”. The interview is worth reading). a bible aloud through the house. remember the Book of Job. It’s hard to find a balance between honouring the old favourites and seeking new potentials for the personal canon. This poem is lovely indeed. This is especially difficult for poets and poems. But luckily, there are many fantastic and sublime poems to discover! Now wouldn’t it be superb to read poetry while drinking the vintage wine? liked this. I always understood that a personal canon of writers was an essential requirement for a reader. Luxurious language. Thank you for sharing it.